Ferrara, Parma, Modena – the Renaissance cities of Emilia Romagna attract with impressive mansions and excellent cuisine. It is well known that a way to a man’s heart goes through his stomach. The Dukes of Este already followed this principle when they turned meals into veritable events. A feast in one of their palaces, e.g.the imposing Castello Estense in Ferrara could last for days, offering shows and delicacies in overabundance. Recipes finvented then can still be found in the regional cuisine of Emilia Romagna. The “Pasticcio Ferrarese” is one of the dishes that already delighted the palates of the aristocracy. The pasticcio is prepared like this: meat ragout and vegetables like pumpkin are mixed with macaroni, the mixture put into an ovenproof dish, béchamel sauce and truffled butter are added and the pie is covered with shortcrust pastry. The pie is served fresh from the the oven and it is only one of many specialities you find on menus of restaurants or farms that operate small BnBs (“agriturismo”). 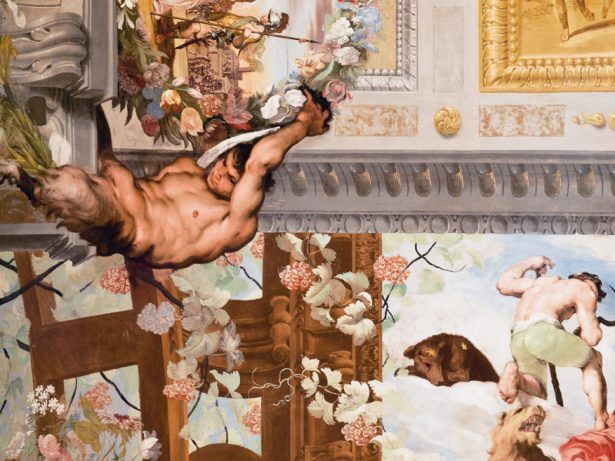 Depictions of naked youths, muscular fauns and busy satyrs show that the princes of D’Este knew to combine culinary delights and carnal desires. Evidence of that can be found at their summer residences of Sassuolo and Reggia Colorno. It is not clear if it was the painters’ or their clients’ idea to show only male figures, some of them even closely entwined. 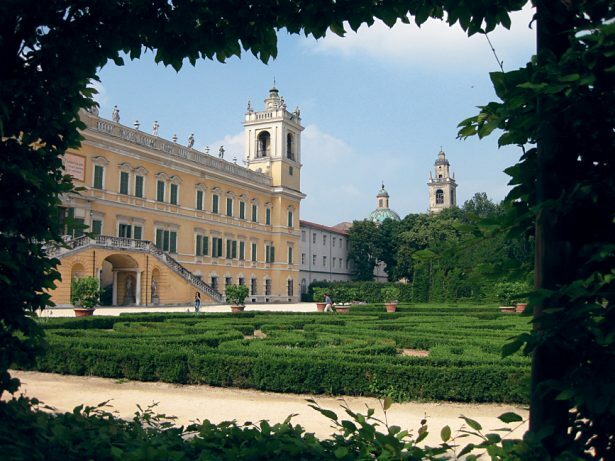 The huge estates – often the size of palaces such like Schönbrunn or Nymphenburg – show wealth, power and patronage. A trip to Emilia Romagna, where the powerful noble families of the D’Este and Farnese once ruled, is a journey to times of Renaissance and Baroque. Highlights are the collection of paintings by the D’Este family in Modena, the enigmatic frescoes in the hall of the months of Schifanoia Palace in Ferrara or the Baroque Teatro Farnese in Parma, made entirely of wood. The old cities feature narrow alleys and many of the shopping streets, which are generally to be found near the cathedral, are in fact arcades. They provide shade in summer and shelter from rain in winter. 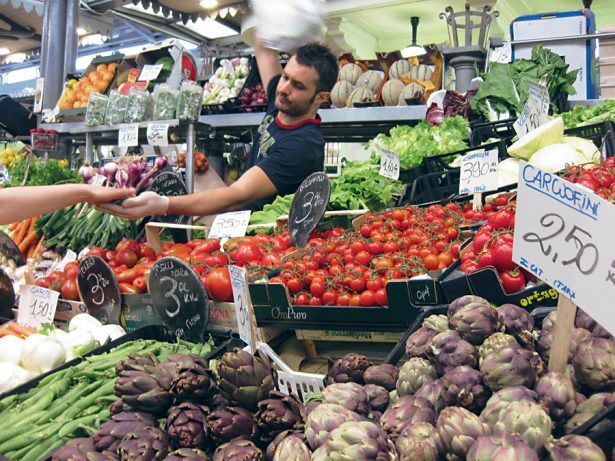 There are numerous small boutiques and speciality shops selling products typical for the region: Parmesan cheese, truffles, ham, balsamic vinegar and wine. 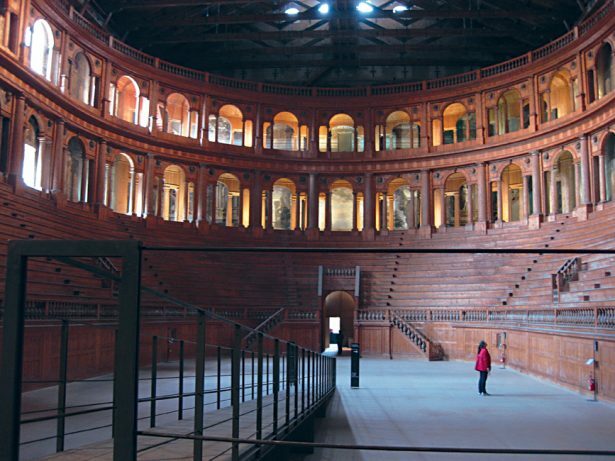 The centre of Ferrara, a designated UNESCO World Heritage Site, can be discovered on foot or eben better by bike. The car-free city centre makes it easy for visitors to discover Castello, Cathedral and Palazzi and get acquianted with the separate medieval and Renaissance districts. Bike hire can be found in many places. Art tours by bike include free admission to museums and palaces. 163 kilometres of cycle lane lead from Ferrara to the fertile Po delta. Car enthusiasts might rather to to Maranello, near Sassuolo Castle and Modena. The Ferrari Gallery show the legendary models of the famous Italian manufacturer. Whether it is due to the universities or to the fact that most young people stay at hotel mama until their thirties: Ferrara, Parma or Modena are are full of young people and every city tends to adapt to a youthful lifestyle in some way. Modena offers free Wifi on Cathedral square and you can even spot people Skyping on the steps outside the cathedral. For any bit of gay scene you have to go to Bologna, the capital of Emilia Romagna, a good 50 kilometres from Ferrara or Modena. About 80,000 students live in Bologna, where Renaissance has also left its traces and which is also known as stronghold of the Italian left “la rossa”, “the red”. This is probably why a lively gay scene with a few bars and regular club nights could develop here. Italy’s gay organisation Arcigay also has its headquarters in Bologna. All this pales in comparison with the splendour the Renaissance dukes enjoyed at their palaces. Official homepage of Emilia Romagna tourism board with information and event calendar. All information on art history of Emilia Romagna. Lufthansa and regional partner Air Dolomiti offer several daily flights to Bologna, Guglilmo Marconi from several German airports via Frankfurt or Munich. Return tickets are available from 99 Euros.